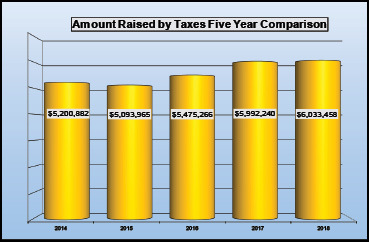 The amount of money to be raised by taxes in Andover is up slightly this year as shown in this five yearcomparison. The amounts to be raised by taxes for Andover for 2018 add up to $6,033,458. This is an increase over last year of $41,218, 0.7%. [See attached chart #1] The tax rate will go up by 0.3%. The tax bill for a property valued at $200,000 will increase from $4,680 in 2017 to $4,694 in 2018, an increase of $14. The 2018 annual School District Meeting voted an operating budget of $5,476,537, down from the previous year by $58,678 (down 1.1%). Offsetting this appropriation was an unexpended fund balance of $38,536 at the end of the 2017-2018 school year that was applied to offset taxes. This was significantly smaller than in previous years as a result of the decision of the School Board to transfer $200,000 of the fund balance to the HS Tuition Trust Fund. The State Education Grant this year is $1,002,211. After accounting for other revenues, the amount to be raised by taxes for 2018 is $3,902,541, up 2.6% over the previous year. The School tax rate for 2018 is $15.21 ($2.06 for the State component and $13.15 for the Town component). This is an increase of 2.2% over the previous year. 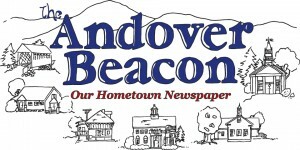 The 2018 Andover Town Meeting voted to appropriate an operating budget of $1,804,127, up from the previous year by $167,209 (10.2%). Additions to various capital reserve funds were approved in the amount of $179,930. Funding for highway special projects was approved for $150,000. The Select Board applied $150,000 from the previous year unexpended surplus to offset taxes. Other revenues resulted in the net amount to be raised by taxes for 2018 to be $1,247,524. This is down from last year by $130,340 (down 9.5%). The Town tax rate for 2018 is $4.84, down 9.5% from the previous year. The amount to be raised by taxes for the Andover Fire Precinct for 2018 is $134,671, up $924 over the amount raised for 2017. The tax rate for 2018 is $0.53. The bill for our share of the Merrimack County 2018 budget is $746.571. This is up from 2017 by $68,915 The county tax rate for this year is $2.89.